Walk in bathtubs can provide those dealing with physical challenges with the ability to safely enter and exit their tubs without the need for assistance. If you would like to add a walk in tub to your home in the St. Paul, Minnesota, area, turn to U.S. Patio Systems and Home Remodeling. We sell and install top-of-the-line walk in tubs from the popular Safe Step Walk-In Tub Co., which means you can rest assured you are getting one of the best walk in tubs currently on the market. Plus, our walk in tubs can create a spa-like environment for you to enjoy at your very own home since they come with heated seats and water jet therapy systems. These relaxing features can even help you to cope with painful symptoms from common ailments like back pain, arthritis, sciatica, and more. 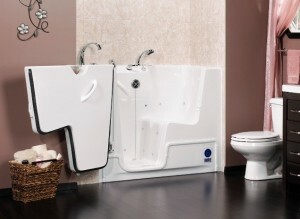 To learn more about the walk in bathtubs we have available, contact U.S. Patio Systems and Home Remodeling. Our specialists can answer any questions you have and will tell you more about all of the products and services we offer to homeowners in St. Paul, MN and nearby communities.